This entry was posted in News & Views, Quotes and tagged devotion, discipleship, egotistical, faithfulness, ignoring the truth, right-wing evangelicals, Trump, truth, Worship on February 10, 2019 by Ray Buchanan. When Mary and Joseph fled to protect the life of their son, Jesus, they became refugees. 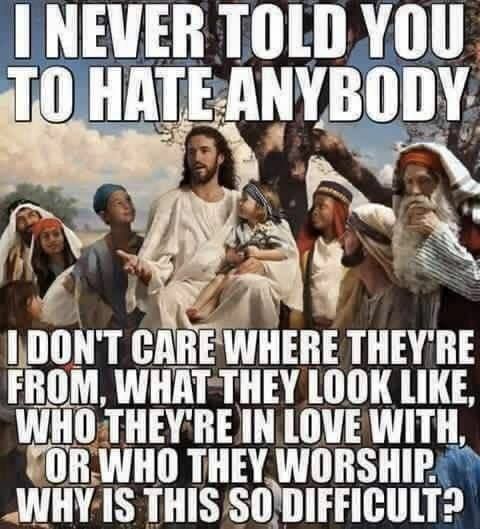 Unless I am sadly mistaken that makes Jesus a refugee. How is it then that so many Evangelical Christians worship a refugee on Sunday, but despise refugees the rest of the week? Am I missing something here? Or, is there a true disconnect with what so many of us profess and what we really believe? This entry was posted in Hunger & Poverty, News & Views, Spirituality & Religious Writings and tagged belief, Biblical evidence, Christianity, disconnect, evangelicals, fleeing violence, Holy Family, Jesus, NAKEDPASTOR.COM, persecution, refugees, safety, truth, values, Worship on January 1, 2019 by Ray Buchanan. Not sure exactly where this is found in the gospels, but I am sure it should be there. Christians have always been identified by our love. Hate has no place in authentic spirituality. This entry was posted in News & Views, Quotes, Spirituality & Religious Writings and tagged bigotry, Christianity, discrimination, gospels, hate, Jesus, love, prejudice, racism, spirituality, Worship on October 19, 2017 by Ray Buchanan. This entry was posted in News & Views, Quotes, Spirituality & Religious Writings and tagged belief, belong, discipleship, God, Jesus, quote, religion, Richard Rohr, spirituality, transformation, union, Worship on January 31, 2016 by Ray Buchanan.